MICHELLE Barrett knew something wasn't right when her dogs wouldn't stop barking in the night. 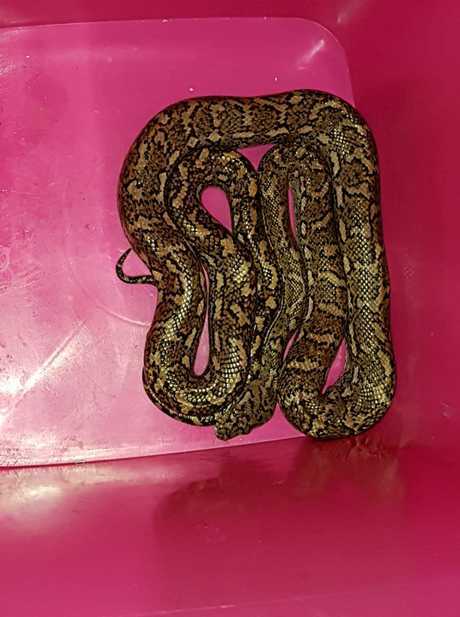 The Maryborough resident got the shock of her life when she discovered a 1.5m carpet python coiled up under her bed on Sunday night. "What's worse, is it was curled up directly where I hop out of bed in the morning," Ms Barrett said. "I didn't know what type of snake it was, so I hurried my dogs out of the room thinking it would be venomous. "I was more fearful for my dogs than myself, but I kept wondering how bad it would have been if the snake was something more sinister." Ms Barrett called over a neighbour to help grab the snake, which tried several unsuccessful attempts to escape. Eventually, the pair manage to secure the snake in a wheelie bin. "When I got a good look at him, he was beautiful," Ms Barrett said. "We ended up putting him in the canefields where he headed out towards the river." Ms Barrett said she wasn't sure how the snake slithered in, but said it likely came in through the back door.